Here's Wolfgang's twin brother Sal, the werewolf singer who holds animosity towards his own twin brother. He appears in Skylanders: Imaginators and first appears in the Golden Arcade chapter of the game. He also appears in the arena battles where he sings the national anthem for Skylands, as well as the village level where you have to lure Cap'n Cluck's chickens into the chicken coops with Sal's help. In Wolfgang's backstory, it says he wasn't always a werewolf, it's possible Sal wasn't always a werewolf either, but due to a curse, he got transformed into a werewolf as well. Even Sal thinks Wolfgang's so backstabbing. Yeah! 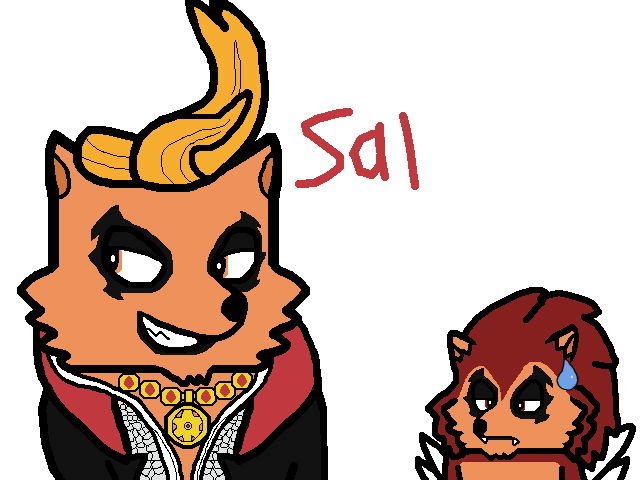 XD Even Sal thinks Wolfgang's so backstabbing.